ViewSonic is officially announcing the integration of its latest SuperColor Technology into their projector product series, ranging from value to high-end models. SuperColor Technology offers better color reproduction capabilities that can consistently deliver the most accurate colors on each point of the screen. It boosts the quality of projected images to match the image quality of our well-known lines of monitors as well. Equipped with SuperColor Technology, ViewSonic projectors provide outstanding features to offer a better projection and user viewing experience, as well as superior image quality. 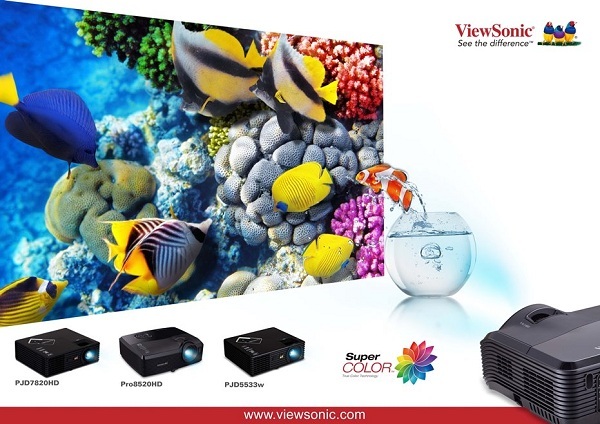 The features of SuperColor Technology, which includes exclusive 5, 6 and 7–segment projector color wheel designs, advanced digital image processing, and dynamic lamp adjustment technology, allows ViewSonic projectors to reproduce accurate, natural, and vividly clear images with expanded color space. Additionally, ViewSonic projectors integrated with SuperColor Technology comes with a ViewMatch color mode that optimizes the color gamma to fit most projection environments without sacrificing image color quality. When it comes to putting an emphasis on sharp definition, and reducing viewer eye-fatigue, ViewSonic projectors with SuperColor Technology provides a perfect solution. Users can now use a projector that automatically adjusts images to enhance the performance of dark scenes while greatly improving the detail in bright images without any color washout. Eye-fatigue from prolonged viewing is also reduced thanks to a more accurate gray scale that enables users to see greater texture in darker images and greater detail in bright-white projected images. Enjoy superior color performances for an unparalleled presenting and sharing experience!